Okay, we get it. CG effects have made it possible for filmmakers to level an entire city. We’ve seen it in everything from Godzilla to Man of Steel to The Avengers, and now we see it again in the new disaster flick San Andreas. I hate to say it, but these scenes of crumbling buildings are all starting to look the same. San Andreas relies on the destruction so much it forgets to make us care about the characters. While there are a couple of spectacular sequences, San Andreas ultimately falls flat, even as mindless summer entertainment. We know from the title that a massive earthquake along the California coast will take center stage in this film. Everyone knows the San Andreas Fault is volatile, but in this film it’s not the only fault causing problems. It turns out there’s another, previously unknown, fault that connects to San Andreas through Nevada. These faults create a rather dangerous wedge of moving plates. It also gives us the best scene in the film where a quake hits at the Hoover Dam. This scene is well done because it’s tense and shows us the human element. Lives are at stake and we can feel it. The same unfortunately can’t be said as the quakes escalate in a chain reaction. Why? Because the human element is largely thrown out in favor of long destruction sequences. Many of these are shot with panoramic view that looks cool, but the distance removes the emotional impact. It’s a reminder that we are mere spectators, not a part of the action. We are not asked to care about the hundreds of thousands of people who perish in these quakes. We are only asked to care about a single family who are trying to reunite amidst the chaos. 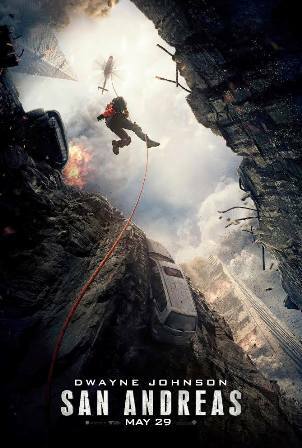 Ray (Dwayne Johnson) is a search and rescue professional who is capable of ripping a car door right off its hinges as he dangles from a nearly out-of-control helicopter. We learn this about him in the open sequence of the film so we know right away that Ray can pretty much do anything. Ray is despondent after learning his soon to be ex-wife Emma (Carla Gugino) and college-age daughter Blake (Alexandra Daddario) are already moving in with Emma’s new boyfriend Daniel (Ioan Gruffudd). Lucky for him, the earthquake puts him in the position of being the hero and Daniel being the zero after he is forced to rescue Emma from a rooftop. Daniel, on the other hand, abandons Blake in a parking garage. Blake is left on her own with only her new friends Ben (Hugo Johnstone-Burt) and Ollie (Art Parkinson) as she makes her way through the devastated city in search of her parents. Oh yeah. Paul Giamatti is in this film too. He’s the seismologist who discovers the new fault line and earthquake cluster. He’s mostly there to offer up exposition so the audience knows why the quakes are striking like they do. He and Ray never meet and don’t ever even know of each other’s existence. I found that to be very disappointing. It was basically two completely separate storylines and never the twain shall meet. I had hoped we would see the characters working together at some point. San Andreas is filled with a bunch of clichés. The dialogue is corny and Ray’s need to overcome a past tragedy feels out of place given the gravity of the immediate situation. Like I stated earlier, the earthquake is so devastating it’s hard to really care if this one small group of people survives or not. Why them and not the other thousands of people in the city? Only because the film told us these are the people to care about. While this film is easy to watch, it’s hard for me to say a film about a massive earthquake is fun to watch when it could so easily happen (and has happened), and there’s nothing fun about that.